Melaney Pettini moved from Portland, Ore., to Vermont 10 years ago to get away from crowds. With a van and a vision — and her husband, Faeryl Rae — she longed for a different way of life. "Looking at the statistics, the entire state seemed comparable in size to the city of Portland," Pettini says. "We didn't know anyone there, so we got in our van and drove to the Green Mountain State." 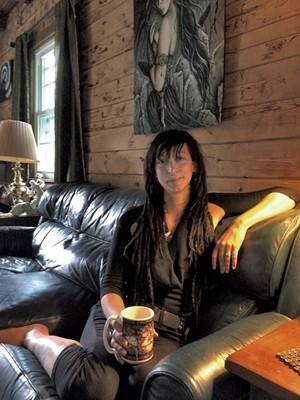 Although she's called Vermont home for nearly a decade, Hanksville resident Pettini, 32, is just starting to "sew" her oats in the local fashion scene. She never thought New Englanders would warm up to her clothing line, called Wings of Sin. "I haven't experimented too much until this past year, because I always thought no one in Vermont would wear my stuff," she explains. "They all wear Carhartts and mud boots." This Saturday, September 6, at Strut — the South End Art Hop's popular fashion show — the woman who once shied away from swarms of people hopes to pack the tent. The rookie's reverie will be realized when her models storm the stage in what she calls a "postapocalyptic" look. Pettini promises her models will do more than sashay down the runway, because they aren't just pretty people; they're also performance artists. A belly dancer, a Hula-Hooper and possibly an acrobat will aim to captivate the audience while also putting the focus on Wings of Sin fashion. Seven Days spoke with Pettini to learn more about the show she calls "a scene from Cirque du Soleil." SEVEN DAYS: Did you always want to be a designer? MELANEY PETTINI: I started sewing when I was 8. My grandmother got me sewing lessons, and I became totally obsessed with it. Then she got me a sewing machine, and I never stopped. I used to live by a velvet mill, and they had a whole Dumpster that was nothing but velvet. Everything I made and wore for years was just head-to-toe velvet. MP: Most of my stuff is very much inspired by kind of, like, a postapocalyptic look. Also very woodland, and mythology is a huge factor — so a lot of my stuff is Norse inspired and inspired by the occult. SD: Who are your influences? My first impression is Mad Max — Beyond Thunderdome, The Road Warrior. You know the movie with Tina Turner, where everyone wore metallic, mullets and dark designs? MP: That's a huge influence. [Mad Max 2:]The Road Warrior is one of my favorite movies. I watched those when I was a little kid. I was probably way too young to watch them, but I watched them anyways. I was obsessed with them and wanted to look like them so bad. I love that you said that. That made me very happy. Also, Wendy O. Williams. She has been a big influence — fashion and her whole attitude was all a big deal for me. SD: Are you nervous for the big night? MP: I love doing fashion shows. For me, fashion shows and photo shoots are the most fun parts of my job, because I get to hang out with my friends — they're all my models. I call the women "the She-Wolves of the Wasteland," and the guys are "Sons of the Damned." We get to dress up and put makeup on and prance around on a runway, and it's fun. It will probably look like a scene from Cirque du Soleil. SD: How did you pay your bills before pursuing your passion for fashion? MP: Mostly jobs I hated [laughs], like a lot of clothing retail, working in fashion being a retail manager. For a while I was a community-outreach coordinator, which was pretty cool because I got to work with charities and such, and it is actually how I got my dog. I really didn't think I would be able to do this full time from Vermont. SD: Do you draw your designs first, or go straight from the mind to material? MP: I do both — it depends on the day. I am not very good at drawing, so when I do draw something, I will say, "That looks so much better in my head." Usually I would say I draw first, then break it down in my head. I don't use patterns; I just measure and cut. SD: How did Wings of Sin take flight? MP: Strangely enough, I started out on eBay about a million years ago, when eBay was just actual regular people selling and not big warehouses. But then I found Etsy, and that was when Etsy first started out. Now I have an Etsy store, as well as my own wingsofsin.com. I was able to find all these likeminded people out there. Yay for internet making it a lot easier." Strut! Fashion Show, Saturday, September 6, 6:30 and 8:30 p.m., in the tent behind the Maltex Building on Pine Street in Burlington. $15.